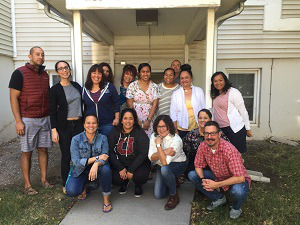 A $600,000 grant from the Andrew W. Mellon Foundation is accelerating the work of faculty, staff and students at the University of Utah who are committed to making the institution a national leader in Pacific Islander (PI) Studies and a collaborative resource for PI communities. Faculty, staff and students involved in building the Pacific Islander Studies Initiative at the University of Utah. After completing the hiring phase of the Pacific Islander Studies Initiative that brought in diverse faculty to the university’s School for Cultural and Social Transformation and the Colleges of Humanities, Education and Health in the last two years, faculty and staff overseeing the initiative are now in the process of preparing curriculum for an undergraduate certificate as well as a summer bridge program geared towards Pacific Islanders from the area’s community colleges. Utah students and scholars will additionally have the opportunity to conduct interdisciplinary and community-based research within the field of Pacific Islander Studies through fellowships and to develop a mutual relationship with PI communities through cultural and language programming. Aikau noted that the unique history of Pacific Islanders in Utah began in the mid-1800s as Hawaiians and other Native Islanders immigrated to Utah with Church of Jesus Christ of Latter-day Saints missionaries who were returning home. Now, the state has the largest number of Pacific Islanders in the continental U.S., compromised of groups including Samoans, Fijians, Tahitians, Cook Islanders, Tongans and more. “So while Pacific Islanders have been in Utah for a really long time, and have been at the University of Utah for a really long time, it really wasn’t until the 2016 hiring initiative that the University of Utah committed to programming, starting with faculty and now with curriculum and a summer bridge program,” Aikau, who oversees the Pacific Islander Studies Initiative, said. Program officials see the initiative not only as a way to attract students from the local community colleges, but also as an opportunity to introduce first year students to the field of Pacific Islander Studies simultaneously. The curriculum will be tailored to both Pacific Islander and non-Pacific Islander students, Aikau said. For Pacific Islander students, the curriculum will help them “think about their identities and what their unique position is on the U.S. continent, [and] how that can inform a business a degree, an education degree, [or] their future careers as engineers,” she said. And for non-Pacific Islander students, academic programming will help them see how history and social issues surrounding Pacific Islanders can help them become better. For example, Aikau said, a teacher who understands the history of the Pacific, the impact of colonization and the resistance movements around the environment or politics can then interact with their students in much more direct and relevant ways. In essence, the Pacific Island Studies initiative will support students’ cultural competency as they prepare to enter the workforce in their desired field. The Mellon Foundation grant will similarly advance research and scholarship opportunities for students and scholars. Particularly, a Pasifika Research Fellowship will be available to students stretching from the undergraduate to post-doctoral level, Aikau said. 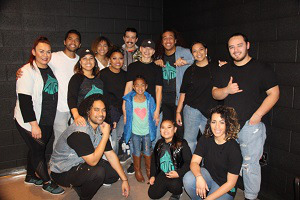 The Nu Tribe Dance Crew, an all Polynesian dance crew based in Salt Lake City, performing during the intiative’s “Dance in the Diaspora” event. The initiative will bring in and train indigenous researchers so they can return and serve their communities. Moreover, community participatory research will explore questions and topics that emerge out of Pacific Islander community needs. One such research topic being explored under the initiative is how Pacific Islander communities can maintain and preserve their indigenous language and cultural practices. Aikau and others leading the efforts for the Pacific Islander Studies Initiative acknowledge that PI students do not come to the university as individuals, but as representatives of their entire families and communities. “Part of what we hope to demonstrate through all of this programming is that the work that their students will do and are doing is for the benefit of their communities, their families,” and the diaspora, she said, noting that officials, likewise, want to send the message that the university is a place for families as well.